Consortiums seek ways to ensure interoperability of hardened IP as way of cutting costs, time-to-market, but it’s not going to be easy. Government agencies, industry groups and individual companies are beginning to rally around various chiplet models, setting the stage for complex chips that are quicker and cheaper to build using standardized interfaces and components. The idea of putting together different modules like LEGOs has been talked about for the better part of a decade. So far, only Marvell has used this concept commercially, and that was exclusively for its own chips based on what it calls a modular chip (MoChi) architecture. Since then, three separate initiatives have been started involving DARPA; IEEE’s International Roadmap For Devices and Systems in conjunction with SEMI; and a group of companies including Netronome, Achronix, Kandou Bus, GlobalFoundries, NXP, Sarcina Technology, and SiFive. There also is work being done in Europe by Leti and Fraunhofer, among others. Marvell introduced its MoChi architecture, which is based on Kandou’s interconnect fabric, three years ago. Since then, momentum has begun building for other companies to get involved, spurred by the rising cost of device scaling and an almost constant state of flux in AI algorithms and new markets such as automotive chips and 5G. Sherwani said this also could lower the barrier to entry for companies developing chips, helping to draw in new talent and younger engineers as the semiconductor industry becomes more affordable and dynamic. There is much support for that approach, particularly among startups and investors. Providing a framework and some standardization can help, and it can significantly decrease the cost and speed of designs. There is still much work ahead to make that happen, and the concept still has yet to be proven commercially beyond a single company. Being able to add enough consistency and flexibility across a global supply chain in a cost-effective way is a significant challenge, but the implications of getting this right are profound. Creating an infrastructure with multiple companies developing hard IP isn’t trivial. And it becomes harder as chips are developed by multiple companies in multiple regions. Sometimes there are language issues, and characterization for reliability, security, and electrostatic/proximity effects may need to be more precise for some applications than others. This is particularly true for safety-critical applications, as well as for combinations of chips involving components developed at advanced process nodes. Marvell’s Kopelman said one of the big problems Marvell encountered was the interface between chips. For cost reasons, the interface needed to run over an organic substrate, rather than using an interposer. A second problem involved partitioning. While much of the attention involving chiplets focuses on time to market and customization, they also can be used with conventional packaging such as fan-outs. One of the big challenges there is die placement. While fan-outs already are in volume production, notably in smart phones based on TSMC‘s InFO architecture, the broader application of this packaging approach is just beginning. The next step is adding repeatability with confidence, and that may require a variety of new approaches. Brewer Science is working on one such approach, using a thin film in a mold compound that works like a stencil. The approach could significantly reduce die movement issues. She noted that also helps with issues such as warpage, which is a growing problem with EMC. A chiplet approach is more modular, which reduces mechanical stress on the various parts. Fig. 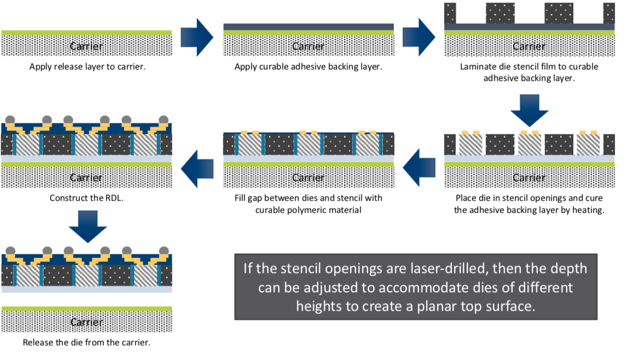 2: Laminated polymetric die-stencil fill concept. Source: Brewer Science. DARPA’s CHIPS (Common Heterogeneous Integration and IP Reuse Strategies) program has won the backing of Boeing, Lockheed, Northrop Grumman, Intel, Micron, Cadence, Synopsys and others for commercial and mil/aero applications. SEMI and IEEE likewise are promoting a common road map for faster integration, and Mentor, a Siemens Business, has established a packaging flow that can help in this regard. That requires domain knowledge, which changes the game on multiple levels. The driving concept behind this is what amounts to mass customization, an approach that third-party IP was supposed to facilitate. What has been missing is a way to put those pieces together more predictably. Das said that requires both synchronous and asynchronous approaches, as well as a common connectivity fabric. Netronome has opened up its switch fabric to facilitate this. Yoon said the emphasis now is on thinner packages and interconnections of 2µ or less, particularly in fan-outs. That means chiplets used in those types of devices will need to be characterized for the same kinds of density and possible interactions as chips that are custom-designed today, and tools will need to account for different IP capabilities and limitations. Tools provide more consistency in configuring these devices. They also reduce the number of errors that can creep into designs, particularly when complexity exceeds the capability of the human brain to map all of the possible interactions and electrical implications of floorplanning in multiple dimensions. That tooling starts on the planning side with EDA, but it continues into the inspection and test phases of manufacturing. In some cases the tools drive methodologies, and in some cases the reverse is true. But once that basis is established, it provides leeway to refine the process, cut costs, and to experiment with new possibilities such as inter-die silicon photonics. While photonics has been on the horizon for some time, it has mainly been used between various types of servers and storage in large data centers. Putting it into a package would have a significant impact on performance, latency and heat-related effects. But how quicky this can be introduced on a commercial scale at a competitive price point is unknown at this point. That said, there is significant momentum toward chiplets, and numerous discussions involving chiplets at technical conferences over the past year often include a mention of photonics as a future direction. Commercially available chiplets are still at least a few years away. They have been shown to work in limited applications, and it’s quite possible a large part of the chip industry will head in this direction over time. But there are still issues to iron out, and it will require the work of many companies rather than just a few.